All VODIVÌ’s accessories are produced exclusively in Italy, using vegetable certified tanned leather. Since it is natural and not subjected to chemical treatments, leather might change colour with time, mantaining unaltered the products preciousness. For some of them it is also used natural dye. Interiors are made entirely with natural textile: hemp or cotton. Metal elements are nickel free. Vegetable tanned leather absorbs the traces of our life, it matures without ruining. The natural ageing does not compromise its resistance, but reveals the signs of time and use as the most personal expression of naturalness and truth. 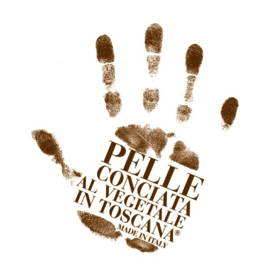 For more info please visit http://www.pellealvegetale.it/en/. Production techniques, inserts and decorative features are made by artisans who work in those territories that inspired bags design. Among these elements there is the pink stone of Mount Subasio, the ceramic of Casteldurante, rust print of Montefeltro. For its collections VODIVÌ is always seeking for inimitable artisanal techniques of manufacturing and for high-quality raw materials, rigorously Italian. VODIVÌ obtained the checked traceability label “TF-Traceability & Fashion” issued by Unionfiliere, promoted by Unioncamere and Italian Chamber of Commerce to requalify and enhance products as Made in Italy protagonists. An important recognition that is only granted after many accurate controls on quality, style, materials, and strict checks of production steps. The TF traceability system is the passport of a product. It provides the consumer with information concerning the location of the main manufacturing processes. Guarantee of such a system is given by an alphanumeric code that is inserted on the product label, reporting all the details of its story. For more info please visit http://www.tfashion.camcom.it/P42A0C0S154/What-is-the-traceability-system.htm.